When I’m thinking of new decks, I enjoy brainstorming strategies that approach the game in unusual ways. I think I’ve mentioned my Maze’s End deck in this space before, and possibly also the one with no win conditions other than stealing something from the opponent. I’ve also made a couple of decks that want to deplete their own library, involving the likes of Shelldock Isle, Ire of Kaminari, and Spider Spawning. 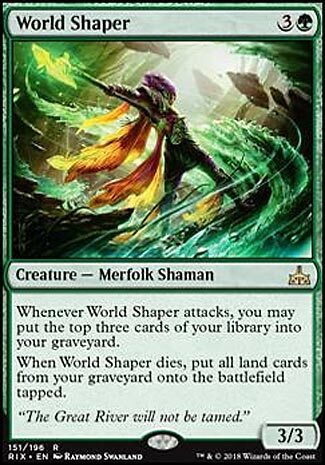 With cards like that, the combos or interactions tend to be the main attraction, but World Shaper has a curious contradictory element where attacking with a 3/3 creature will usually win the game faster than whatever it’s setting up by putting things in your graveyard. On the other hand, you can certainly get some kind of landfall rush if you have a way to sacrifice it the same turn you play it, not to mention turn it into a loop with the likes of Phyrexian Reclamation. It’s not the sort of card that immediately jumps out as an obvious all-star for competitive Magic, but the range of interactions it opens up means that it will certainly find a niche somewhere. This card gets the gears in my head turning. Whether its for Delirium or Delve, there are plenty of strategies that involve self-milling. Due to decks having only 40 cards and only a few bombs in said deck, I don’t recommend this strategy in Limited. The second ability is just asking to be used in a Golgari sacrifice deck. If Ranging Raptors has taught me anything, people would rather take damage then have you mana ramp, so killing World Shaper might be tricky. Ramunap Excavator is the first combo piece that comes to mind for me. I will admit this card has some great art from Raymond Swanland. World Shaper isn’t for everyone, but its a piece that can help fuel your combos. Splendid Reclamation may no longer be Standard-legal, but this Merfolk does a pretty good approximation. It even helps load up your graveyard to fuel a bigger splash; a four-mana 3/3 is questionable, but it is part of a well-supported Standard tribe in Merfolk (making it likely it’s attacking as more than a 3/3), and it doesn’t mind if it dies. I’m unsure of if it’ll make an immediate splash in Standard, since it’s not a format with a lot of fetchlands or graveyard synergies at the present, but it may well have a home in Modern as Splendid Reclamations 5-8 in the Valakut decks of the format. It has potential: the challenge will be to see where it winds up.